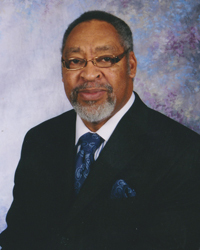 Bishop Robert A. Baker, Sr.
Bishop Robert A. Baker, Sr. was born in Indianapolis, Indiana, to Rev. Robert and Waneda Baker. He, along with his twin brother, Albert, attended Indianapolis Public Schools, graduating from Crispus Attucks High School in 1966. He experienced the new birth at Grace Apostolic Church in l968 under the pastorate of the late Bishop Morris E. Golder, in Indianapolis. He enlisted in the United States Air Forces where he continued his education, and was honorably retired from service in 1990. Towards the end of his career he was stationed in Izmir, Turkey, which is one of the seven churches of Asia Minor (Smyrna), and appointed Pastor of the Gospel Service, by the Air Force Chaplaincy. Many were baptized and filled with the Holy Ghost while under Bishop Baker’s ministry. Before leaving Turkey the Lord placed a burden on his heart to start a ministry back in the United States. Being obedient to the voice of God, Christ Church Ministries was founded in 1988, in Hampton, VA. Under the divine leading of The Holy Ghost, God has since blessed souls to be saved, and lives changed through this ministry. Because of the many souls being added, God directed Bishop Baker to our present location in December 1991. At this location the new worship center was completed in August 1997, and we are currently in the process of constructing our new educational wing and administrative wing. The Pentecostal Assemblies of the World, Inc. licensed him as minister in 1974 and he was ordained in 1984. Bishop Baker was elected Chairman of the Virginia State Council in 1996, and re-elected in 1998 and 2001. He was elevated to the office of Suffragan Bishop of the 32nd Episcopal District of India in September 2000. Bishop Baker served on the Board of Directors of the Pentecostal Assemblies of the World International Missions Department (IMD) in several positions from 2000 to 2013. He was the Vice Chairman of the IMD from 2010 to 2013. During the 98th Pentecostal Assemblies of the World Annual International Convention, which convened in his home town of Indianapolis, Indiana in August 2013, Bishop Baker was elevated to the Office of Bishop and assigned to the 44th Episcopal District of Zimbabwe. Bishop Baker is also, the founder and Chief Executive Officer of Lighthouse Outreach Inc, a Non-Profit organization, with an annual budget of $600,000, a staff of 10 employees, and over 20 contractors. Bishop Baker is a preacher, a teacher, a man of God after God’s own heart, who loves the people of God. He is happily married to the lovely Evangelist Patricia Baker and from this union they have four children, twelve grandchildren and 5 great grandchildren.